There are six Media:scape pods on the fourth floor of the main library. 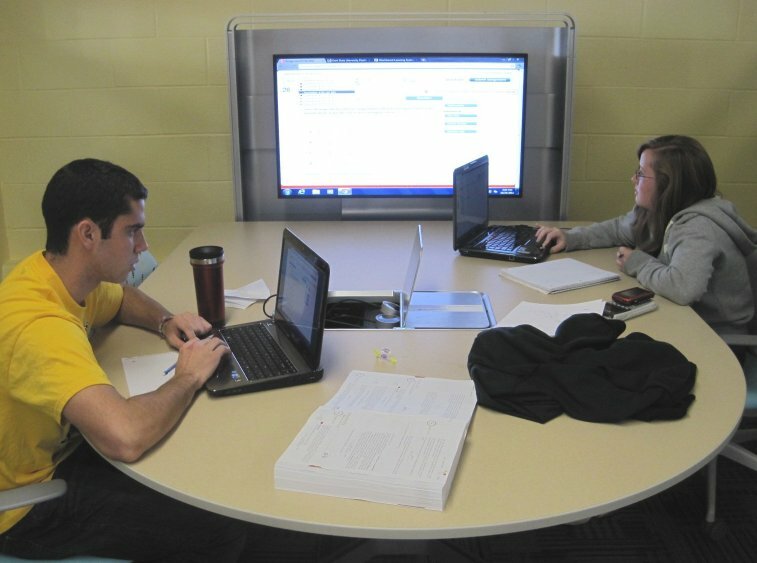 Students are able to share individual content from their personal laptops with other group members using a large 42" flat screen monitor. Viewing is controlled by each member of the group using Media:scape's media well and the personal user control key (PUCK). Each pod has a "connect and share" environment; laptops are connected to the Media:scape through the VGA port on your personal laptop. Special adapters for Apple computers are available for check out at the first floor Circulation Desk. Use LibCal to schedule a pod. Arrive at your scheduled time and go directly to your pod. If there are any questions, please ask at the Ask Me Desk on the first floor of the library. Pods are available for scheduling Monday through Friday from 9 a.m. until 9 p.m. up to 7 days in advance. Pods must be scheduled before 5 p.m. one day prior to the date of use on weekdays and before 5 p.m. on Friday for use on Mondays. Pods are scheduled in one hour blocks. You may schedule a Media:scape pod for a total of two hours per day. Two hours may be a combination of one hour in one pod and one hour in another pod or two hours in the same pod. The hours may be consecutive or at different times during the day. If you schedule a pod and do not show up within 20 minutes of your scheduled time, you forfeit your scheduled time and others may use the pod for the remainder of that hour. Repeated no-shows will result in you being blocked from scheduling Media:scape pods in the future. If you have scheduled a pod and must cancel within 24 hours of the scheduled time, please email the library at <library@kent.edu> with the reservation information (date, time, name). If a pod is not scheduled for a specific hour, that pod is available for use by anyone for that hour. When your time has expired and the pod is scheduled for the following hour, please leave the pod promptly. If there are any questions or problems, please ask at the Ask Me Desk on the first floor of the library.